What are steps for implementing Webservices through PeopleTools 8.49 and 8.47? Main differences in the configuration setup of these? There are significant changes to the terminology and concepts used between 8.47 and 8.49 in integration broker. 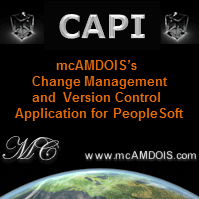 These changes were first introduced in PeopleTools 8.48. I don't have access to an PeopleTools 8.47 environment so its a bit hard to comment. I would suggest the best place to get this information is from Metalink. Oracle provides release notes detailing changes between PeopleTools releases. Search for PeopleTools release notes. You may also find some useful information about PeopleTools 8.48 in the Oracle documentation library. You can use the Oracle Hosted PeopleBooks to get information about PeopleTools 8.49. Generally, I believe the the biggest thing you'll notice is the change of terminology. There are also some wizards for exposing web services (and other functionality) that may not be available in PeopleTools 8.47. If you have a more specific question about this please post more details. Hi, I'm working on a PS 8.47 environment and I'm trying to publish a component interface as a web service in order to send data from third party or personal applications to PS. This is the message I'm sending. And if I go to Monitor integrations on PS, the XML saved by the IB has no header so no username or password information. The strange thing is that I'm using the soap message template generated by soapUI, I tried toput the security part of the message in the body tags but it doesn't work either, I get the same error. I don't explain the CI or anything else because I think this error is on the IB itself and not the CI, also I modified the namespaces because I can't paste links. Hi Rafael, did you ever resolve this problem? We are having the exact same issue and cannot figure out what is causing it.